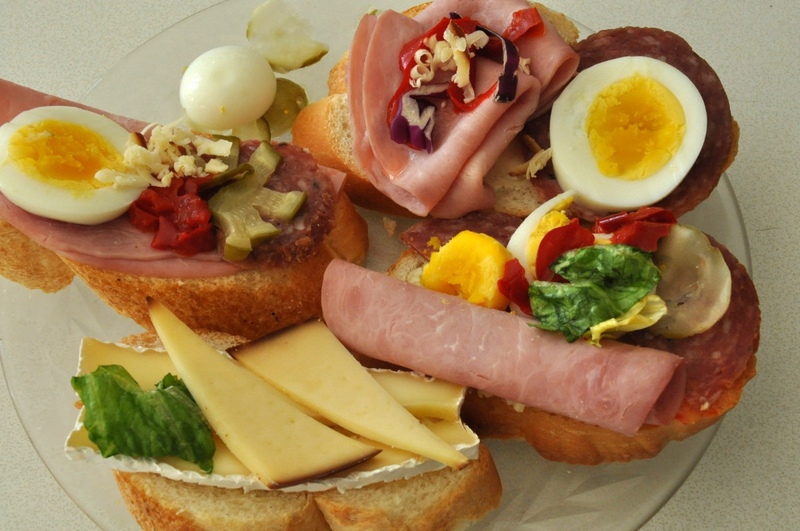 Sandwiches are a popular part of Slovak cuisine. But in Slovakia, sandwiches are eaten a bit differently than here in the States. First, sandwiches are a very valid option for breakfast. They can also be eaten for light dinner. Sandwiches are not so common for lunch; typical Slovak lunch consists of soup followed by a main meal that you eat with a fork and knife (like goulash and dumplings or schnitzel with potato salad or even rabbit on mushrooms). The other difference is that sandwiches in Slovakia are served open-face – that is, there is no bread on top. There is really not much to making chlebíčky. 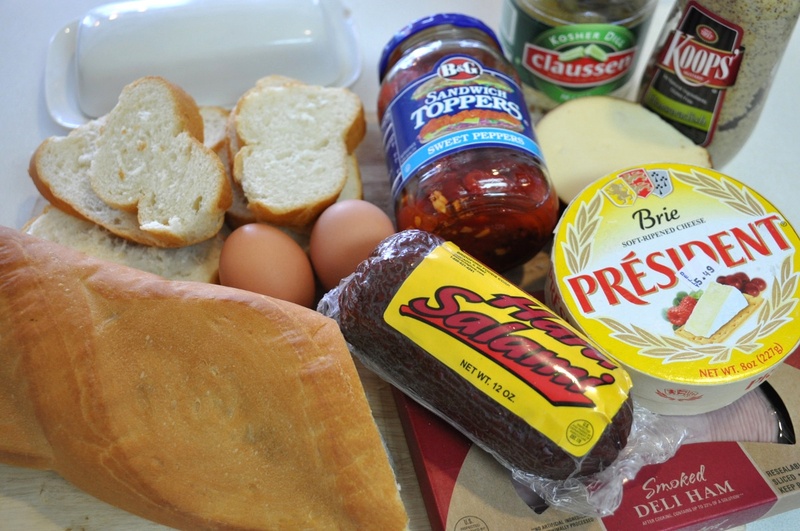 Just grab some bread, some spread such as butter and mustard, your favorite salami or ham, and toppings such as the red peppers in a jar. Also slices of hard-boiled egg. Feel free to make some meatless (butter, egg, and cheese is a great combination). Add hot chocolate and you got yourself a tasty Slovak breakfast! And just couple more photos. The one on the right is of me few years ago eating open face chlebíčky in Slovakia after finishing the Košice Marathon. They tasted great! The other person in the photo is my grandma who is a huge inspiration for many recipes on this site. I want to thank “lubos” so much for all the wonderful Slovac recipes I am learning so much about the culture and food of the slovac people. I hope to impress my soon to be daughter-in-law with my first Slovac dishes at a family gathering in June. Thank you for all your emails and please continue sending them because I love them. I also want to thank you for sending not just the recipes but for the beautiful pictures of the dishes. The step by step preparation is awesome. Thank you Elda! Congrats on the upcoming wedding. Does your future DIL live in the States or will you be traveling to Slovakia for the family gathering? Those sandwiches look delicious. Some of the best breakfasts I had were in Slavic Europe! Does your family sometimes use a personal-size cutting board for each person instead of a plate? Yup. Also a wooden spoon (varecha) is a totally acceptable substitute for spoon when eating halusky. My siter-in-law is Slovak and she always made me the most delicious breakfast sandwiches when I visited them! Oh, how I long to go back to Slovakia! I am Slovak, but we never had sandwiches for breakfast. 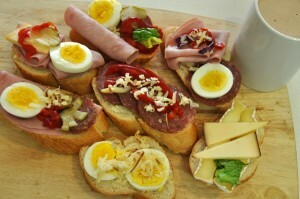 However, when we visited my Grandmother, she always served rye bread and ham, hard boiled eggs, etc. Now I know why we always seemed to have sandwiches at her house. Thank you so much for this website. Someday I hope to visit Slovakia. I love chlebicky, easy to make and when combined with veggies (green peppers, tomatoes, radishes, scallions, etc.) you have a good balanced meal. Variation of that is that you put chlebicky on a smaller piece of bread to oven and bake them a little. It makes a wonderful, crispy, and tasteful snack when you have a company. I’m doing a huge culture project at my school on Slovakia and I needed a nice easy traditional food to serve. This is going to help a ton! Yummy this food is always served when we go and visit a family or if it’s somebody’s birthday, so easy to make and so delicious! Alternatively we get a cold meat/cheese/pickle platter where you can put on your plate whatever you want and eat it normallky with a slice of bread. Also, when I do these sandwiches I make them with a delicious spread. For the spread I finely great cheese(smoked variety tastes best), crush couple of cloves of garlic and mix with mayonnaise or even beter tatar sauce. Try it! These look just amazing. Mouthwatering. There is not more I can say. They are so easy to make and so delicious it’s almost unbelievable. Hi, I´m czech, born in Prague, living since many years in Germany. I still love `oblozene chlebicky`, too. I do make them the same way! My husband is Czech and his mother and step mother always make these with what looks like czech potato salad on them. Have you seen this variety and do you know if it is actually potato salad? I would love to have the CZ potato salad recipe if you don’t mind. I am also Czech and this would be a wonderful addition to my cooking. Thank you so much! Love this site! Sandy, my grandmother was Czech and my Mother Slovak so she learned both from her mother and her mother in law. She loved to cook and for Christmas Eve we always have paternal Grandmother’s Czech potato salad. It is made with cooked potatoes, as usual, with diced onions and celery, and hard boiled eggs. No mayonaise, but she added sour cream. Only. Of course, seasoned to taste. (I usually add just a touch of celery salt.) Has to be plenty sour cream so it isn’t dry. My kids love it! I’d be interested in knowing what others call Czech potato salad. Toni Brendel, aka Charlotte Antoinette Or Slovak, too. Grandmother’s Czech potato salad. It is made with cooked potatoes, as usual, with diced onions and celery, and hard boiled eggs. No mayonaise, but she added sour cream. Only. Of course, seasoned to taste. (I usually add just a touch of celery salt.) Has to be plenty sour cream so it isn’t dry. My kids love it! I’d be interested in knowing what others call Czech potato salad. Toni Brendel, aka Charlotte Antoinette Or Slovak, too.